Summer is usually the slow, sleepy season for big-city gastronomes, a time to sample “handmade” ice creams, sip craft-beer shandies, and quibble over the merits of your favorite hot dog or fish taco under the shade of the nearest tree. But these days, notable new restaurants seem to be popping up around town like proverbial lemonade stands. Ivan Orkin’s excellent three-star ramen joint recently opened, and so did the newly revamped, slightly less excellent version of Tavern on the Green. The food blogs have been abuzz lately with breathless news about the prime-rib burger at Cherche Midi, Keith McNally’s new bistro on the Bowery, and the local Francophiles in my neighborhood can barely contain their excitement about Carlos Suarez’s new Provençal-themed restaurant, Claudette, which opened this May in a perpetually doomed space just above Washington Square. Lost in all this unseasonal commotion has been the quiet, exceedingly soft opening of Drew Nieporent’s latest old-fashioned gourmet venture, Bâtard. Like Nieporent’s other old-fashioned gourmet ventures, Montrachet and, more recently, Corton, this one is named for a famous Grand Cru appellation in the Nobu mogul’s beloved Burgundy. The new restaurant occupies the same ground-floor space on West Broadway in Tribeca as the others did, although unlike the Montrachet-­Corton transition, the restyling this time seems to have been minimal. The kitchen is more or less the same one from the Corton era, and the walls, now golden, are still patterned elegantly with acorns and blowing leaves. 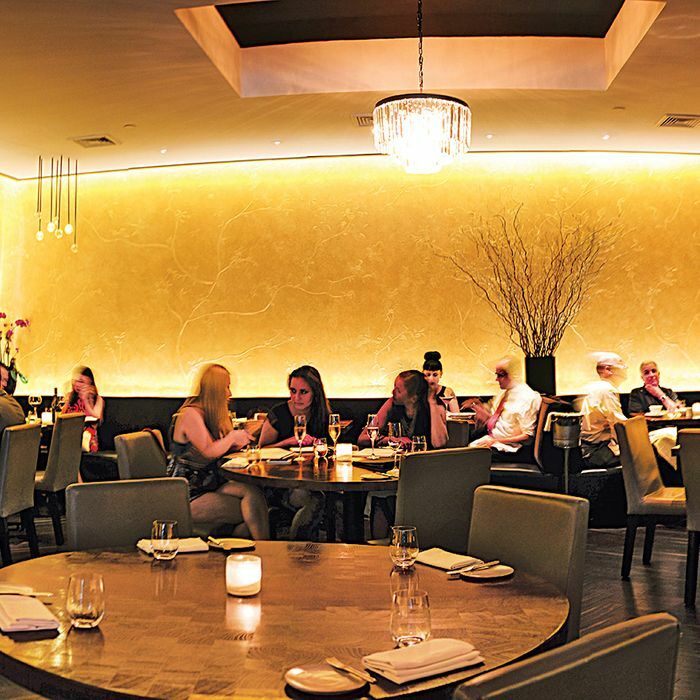 Corton’s strange glowing light fixtures have been removed, however, and this time around the unpretentious, wood-topped tables are devoid of fancy white linen. After the elaborately composed creations of Corton’s former chef, Paul Liebrandt, there’s also a certain refreshing unpretentiousness to the compact prix fixe menu at Bâtard (eight appetizers and eight entrées to choose from), and to the prices too. The most expensive option costs a very reasonable $75 for four courses, although my guests and I were happy to pay $10 less for the three-course dinner, which in my case began with a bowl of minty, nicely textured pea soup that was scattered with little croutons of crispy sweetbreads and contained crumblings of salsify hidden in its depths. There were also crinkly tubes of zucchini blossoms stuffed with bits of fresh lobster on the table, seared slices of ocean trout dabbed with crème fraîche, and a version of artichoke barigoule so technically perfect that it caused my vegetable-snob wife to put down her fork and practically clap with glee. The creator of these classically sophisticated dishes is a refugee from the Gordon Ramsay empire named Markus Glocker. The young Austrian cook has also worked with Charlie Trotter and the prominent Austrian chef Eckart Witzigmann, and although he may not have the antic, madcap sensibility of Liebrandt, his food is impeccably sourced, professionally plated, and generally delicious to eat. In addition to the artichoke barigoule, we enjoyed a serving of plump, faintly eggy tortellini stuffed with black olives, and a trio of gently poached Kusshi oysters from Vancouver, which worked much better once we removed the clunky garnish of fried pig tails from their tops. The roasted beets “Linzer” suffered from similar structural problems (there wasn’t enough pastry), although the buttery Parmesan risotto is a perfect complement to the 20 or so white Burgundies on Nieporent’s truncated but still impressive list. So, for that matter, is the baked turbot, which Glocker and his assistants plate in a vividly green parsley coulis and stuff with the yolk of a single, deftly concealed poached egg. If you want to roll out the heavy artillery, like the gentlemen at the next table with their three open bottles of Montrachet Grand Cru, there’s also an elegant rabbit dish on the menu at this elegant restaurant (prepared in the “bouillabaisse” style with saffron ravioli and a garlicky rouille sauce), and a decent if slightly bloodless pre-carved strip loin, the best part of which is the dense little mound of braised beef cheeks on the side. The lamb rack for two is more successful (pay special attention to the fatty strips of lamb bacon), but the dish I can’t stop talking about is the veal tenderloin “tramezzini,” which the kitchen wraps in a golden crust with a scrim of Swiss chard, and garnishes with veal jus and chanterelles, like an exotic, savory form of French pastry. Maybe because it’s summertime in the city, there’s a leisurely, almost neighborly feeling to the proceedings at Bâtard, although it’s true that most people in this particular neighborhood seem to be wine-guzzling titans of finance. The room is buzzy without being loud and comfortably sophisticated without feeling stuffy, and on many evenings, the proprietor is there to greet his patrons at the door. He would probably tell you that if you wished to continue on the wines, the dessert to get is the funky little spoonful of Époisses, served in a glass bowl with a slice of grilled baguette and a drizzling of mushroom vinaigrette. But the one that will make all the headlines (and Instagram feeds) is an inspired creation called caramelized milk bread, which seems to have been conceived as a kind of gourmet hybrid between sticky-toffee pudding and French toast but, thanks to that timeless alchemy between milk, caramelized sugar, and brioche, tastes better than both. Hours: Tuesday through Saturday 5:30 to 10:30 p.m.
Prices: $55, $65, and $75 prix fixe. Ideal Meal: Pea soup, veal “tramezzini,” caramelized milk bread. Note: The Austrian chef offers an excellent off-the-menu schnitzel, made with chicken instead of veal. Scratchpad: Two stars (at least) for the confident cooking and half a star each for the wines and the relatively modest prices. Platt Chat: Are Restaurants Getting Fancier?